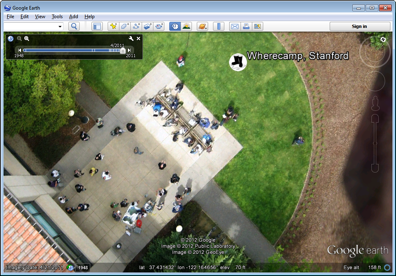 This is from Google, check it out, and go Fly A Kite! Here at Google we publish a lot of imagery, most of which comes from the satellite and aerial imagery providers with whom we partner. 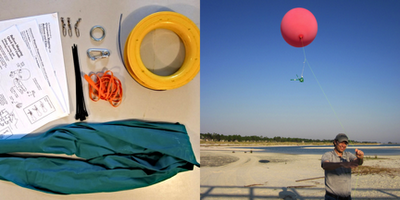 Last week we published something a bit different: images collected from balloons and kites! The resolution is amazing, and it’s something that just about anyone can do themselves. Our friends at The Public Laboratory for Open Technology and Science have been working hard to make imagery collection easy, cheap and accessible. Their grassroots mapping work is based on the idea that citizens anywhere should be able to explore the environment in and around their communities, by collecting their own imagery and other data, and to do it in a way that is useful for scientific and social purposes. The Public Laboratory has developed an open source balloon mapping toolkit that allows anyone with an inexpensive digital point and shoot camera, and about $100 of other parts (balloon, helium, line, soda bottle, etc.) to take photos of the ground around them. They also provide a web-based tool called MapKnitter for aligning the photos into a georeferenced image that can be used inGoogle Earth and other digital mapping tools. 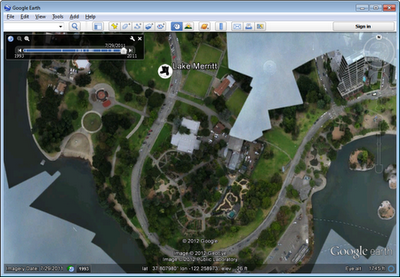 We’ve imported many of the images from the Public Laboratory’s archives into Google Earth’shistorical imagery database. To help you find them, download this KML file, open it in Google Earth (make sure you’re using the latest version), and fly to the image locations in space and time. Have fun exploring this unique imagery!